Published: May 16, 2014 at 08:03 p.m. Updated: May 17, 2014 at 10:35 a.m. 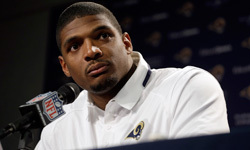 The Michael Sam docuseries is on hold. The Oprah Winfrey Network (OWN) on Friday announced a postponement of the series set to chronicle the life of the St. Louis Rams rookie. "After careful consideration and discussion with the St. Louis Rams, 'The Untitled Michael Sam Project' has been postponed, allowing Michael the best opportunity to achieve his dream of making the team," network president Erik Logan wrote in a statement. "OWN is about elevating and empowering people to achieve their best. It's clear that we, along with the world, recognize the important opportunity that Michael now has in this moment. We will continue to support him in his journey to earn a spot playing for the Rams." Sam's agent, Cameron Weiss, released a statement of his own, saying: "After today's meeting with the Rams, we collectively feel it is best to postpone the project. This will allow for Michael to have a total focus on football, and will ensure no distractions to his teammates. Everybody involved remains committed to this project and understands its historical importance as well as its positive message." Selected in the seventh round of last week's draft, Sam's intentions to star in the series came as a surprise to both the Rams and the NFL. "No way," NFL spokesman Greg Aiello told NFL Media's Albert Breer when asked if the league was aware of the show before the draft. "Did not know anything about it until after the draft and have not agreed to anything about it." OWN didn't plan -- or have permission -- to take its cameras inside the Rams facility during filming, but it was at Sam's initial news conference this week and also on hand for Friday morning's team workouts. While we doubt the filming would have grown into a major issue, allowing Sam to focus on football can only help a late-round pick with hopes of playing in September.